Scancon introduces the SCH94FO encoder, the industry's first rugged and reliable Fiber Optic encoder. The SCH94FO was specifically designed for use with Wind Turbine generators and offers either dual Digital/Fiber Optic output or a single Fiber Optic output. The Scancon SCH94FO is a heavy duty incremental encoder offering Fiber Optic output. The SCH94FO incorporates the rugged design features of Scancon's industry standard SCH94 hollow shaft encoder with the high transmission distance and noise resistant qualities of Fiber Optics. 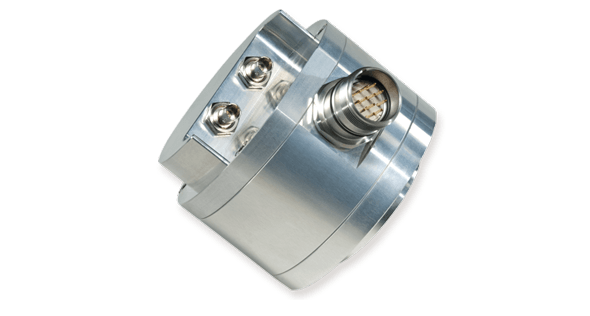 The result is the industry's first rugged and reliable, dual-output Fiber Optic encoder. The SCH94FO encoder is designed to operate with both a Digital output and a Fiber Optic output. The customer may also choose to use only the Fiber Optic output. The encoder also offers the option of either Red Light transmission or Infrared Light transmission. The Red Light option allows the customer to actually see if the fiber is transmitting when power is applied to the encoder. This option is limited to a transmission distance of 250 meters. The Infrared Light option allows for a much longer transmission distance (up to 2,000 meters). However, light transmission cannot be viewed directly as with the Red Light option. The SCH94FO encoder is ideal for those applications requiring safe signal transmission over long distances.